Most dance clubs and schools have (at least) one practice evening per week. That is also the minimum you need to learn to dance. I found it interesting to collect a little what dancers do (or not) like about practice nights. A greeting upon entering is always appreciated. A solid, recognizable and typical start tune used. Sometimes there is as slow warm up a slow waltz. Very often immediately flown with popular quickstep. The decibels may be soft enough to talk anywhere in a normal way. The practice evening is a social event for more than 50%. Alternating use of light as atmospheric element should certainly be fine. As a separate exercise edge is possible: very good idea. The condition of the floor is important, at a practice evening even more than in class. 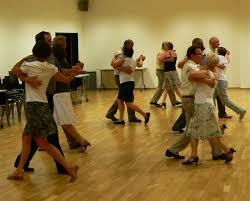 Sometimes one or a few individual practice nights for beginners are useful to get newbies on the dance floor. It's nice if the teacher (s) is also present and accessible, and helpful. Dances in which new figures were seen are more often played, so they can practice. Also on slower rhythms. The dances are usually played by two. (Sometimes a slow and a fast, or vice versa.) If it's very busy on the dance floor (quickstep, slow waltz ...) is also sometimes a third. Then it is useful that the DJ mentions this at the 2nd dance, so that the group can make some changes. Otherwise, you get 2x a full floor, and 1 x an empty. Sometimes the DJ gives a junction: the first dance e.g. only for 1st, 2nd (and 3rd year). For less popular dancing, with long tracks of +4, +5 minutes, and exhausting dancing (waltz, samba, ..) suffices 1. Rather spaced two times one dance, then two in quick succession. Useful that the DJ in advance reports that’s coming just one. It may be useful to count off the start of a line dance, so everyone starts together. Up-tempo and quiet music are also interspersed. Viennese Waltz + samba+ jive? Too much of a good thing! Latin and ballroom are alternated. Also, with a party dance (slow, mars, ..) or something from the salsa family (mambo, bachata, merengue). In many dance schools is announced what dance will come. (Title, performer, and fun facts (in short) are also sometimes included.) Not always necessary, but especially for beginners interesting. Sometimes a playlist is created beforehand that is played by the computer. Then there is certainly made a good and thoughtful distribution. Otherwise, the serving DJ might have a turf list to keep track of how often he played what genre dance. To forget nothing. And to get balance. A good DJ plays not just what he likes, but also what his audience appreciates. A good DJ plays music not only from his own good years and memories. But also from therefore. And from now. Want to appeal to young people, play young music ,popular songs from the top 30. The dancers in many dance schools can perfectly predict which dance and music will follow. Year, after year for decades. Boring! Good and popular evergreens can continue to be used. But concern for variety. And occasionally surprises. Dance schools that have multiple DJs work even though a more varied range of music itself. A must therefore. Sometimes there are theme nights, like Christmas, Valentine, Halloween. With custom music. And decoration. As closing song may be some quiet music used that cannot immediately easily be danced to. Training is a little more intense than practice. Then you go (under supervision) targeting and finishing at competition level. For competitive dancers are usually special training evenings. Try as participant to vary your dance. Instead of making the same turn the disco bar, and the same walking motion at the emergency exit, the same figure for the counter: rotate it too. Or mix it all together. Ditto for the latin figures. Want to hear different music or see other figures and people? Visit also other dance schools. Come at the first time a little late, so the regulars already occupy their 'fixed' places and so you bore nobody by taking a 'fixed' place.